All over campus, students are signing over their information to support, well… something. Petitions supporting marijuana legalization, death penalty expedition, political campaign funding disclosure and more are offered on nondescript clipboards, with only the vaguest descriptions proffered by the people behind them. Many of these canvassers are paid by, or volunteer for, private organizations with uncertain motives. Johnson and his partner regularly set up at a table in the thoroughfare in front of the library, enticing students with charm and compliments, then walking them through their staggering twelve petitions. The majority of the petitions are for legislation covering a range of current social issues, and several feel as though further education is necessary to fully understand the politics behind them. Where one would find this information, however, is a little more unclear. 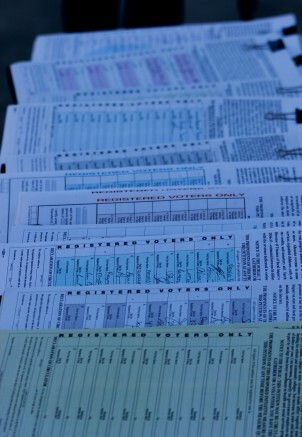 Most, if not all, petitions require students who are registered voters to sign their names and addresses. “Well most of them, I hear them all the time, and the kind of make sense.” said Alli Peat, an ARC student. She’s never signed petitions before, but on the day of the interview, she “had time”. The general attitudes among students towards the petitioners range from perfectly harmless to complete indifference. Hundreds walk by every day, either purposely or unknowingly ignoring the calls of the canvassers. Their calls and cajoles range from innocent to aggressive. Many of the canvassers are regulars, but here and there private citizens pop up with personal petitions, and not much distinction among them. Traditionally, canvassers can be paid per signature, or per page filled. This is not a new issue for students on campus; as previously reported by the Current in March of 2014, a petitioner was detained after slapping a student on campus following an altercation. Pavel Postelnyak was arrested and charged with battery after slapping Peter Messick, then a theater major. At the time of arrest, Postelnyak was in possession of a knife and brass knuckles, according to the police report. There is no vetting process in place for the people setting up tables in the halls – following the first amendment, anyone has the right to assemble at public locations, which includes our campus. The petitions these canvassers are offering may be entirely innocent, but questions shouldn’t be answered with shifty looks and shuffled papers. Justina is a second-semester student on the Current, where she serves as opinion editor. She is majoring in journalism, and plans to transfer to study communications. Be the first to comment on "Opinion: Petition for what?"